Building on a strong mathematical foundation, students at NDAE use technology to bring real­world math problems to life. Students collaborate with one another and with hands­on manipulatives to develop a variety of problem­solving strategies. They work to model good mathematical practices including perseverance, applying prior knowledge, and constructing viable arguments. Real­-life math application, from calculating the sales tax on a video game to analyzing average daily water consumption, makes the content relevant to students’ lives as they progress to more challenging topics of study. 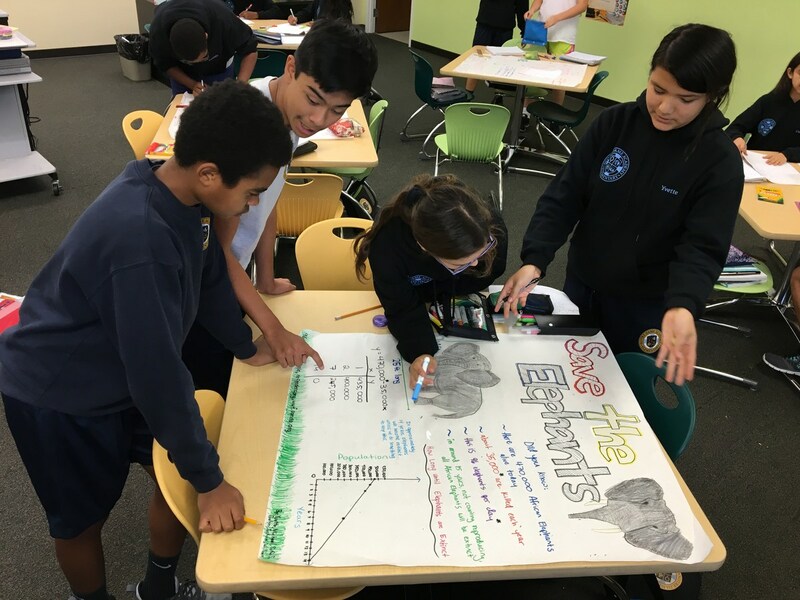 Middle school language arts students learn to articulate and express their ideas and beliefs through rigorous and meaningful experiences with a variety of fiction and nonfiction texts. A core element of the language arts program is the development of students' communication skills. Students practice communicating across a variety of platforms, including engaging classroom discussions, written narratives and essays, technological presentations, public speaking, and media and art. Students become experts in effectively navigating the different expectations and challenges of these different forms of communication. As their communication skills evolve, students engage in actively reading and analyzing a text to develop their higher­level critical thinking skills, build their general knowledge and vocabulary, and participate in a larger global community, fostering a life-long appreciation for literature. NDAE scientists bring a love of science, excitement for discovery, and a passion for learning to the classroom each day. Students in fifth through eighth grade explore their world through experimentation when building volcanoes, looking at cells under a microscope, dissecting chicken wings, and combining the principles of physics to solve real­world problems. Enhanced by technological tools, NDAE scientists are constantly being challenged to think critically, persist, and become independent and conscientious leaders. NDAE's middle school social studies program allows students to engage with the past while making connections to their own lives. 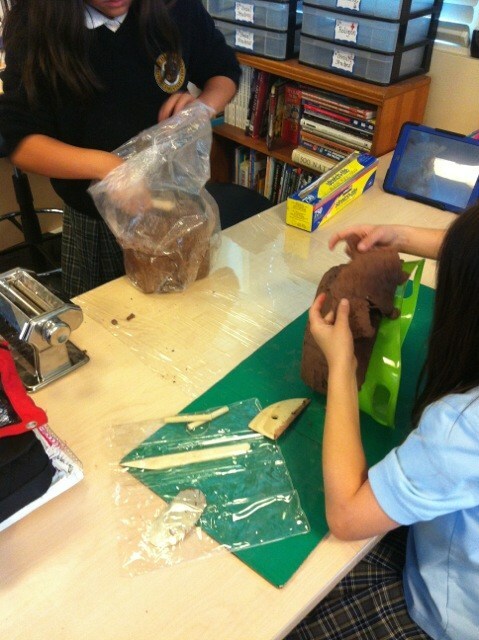 Students have opportunities to bring history to life through hands­on experiences like mummifying chickens, simulating life in feudal Japan, and creating iMovie commercials for the 13 colonies. Students read, write, and think like historians. Students analyze primary and secondary texts and ask critical thinking questions while using technology to develop a thorough understanding of how the world they live in today came to be. These learning experiences, both collaborative and individual, support students in their development of 21st century skills needed to be successful in high school and beyond. NDAE young theologians, grounded with a firm foundation in scripture and the sacraments, learn to express their faith in words and actions. Students learn valuable life lessons from the parables that help them to make sense of the world around them and develop a loving personal relationship with God. From the teachings of the Old Testament and discussions about the Habits of Mind and Growth Mindset concept, students learn that God does not call perfect people, but that He qualifies each of us for the tasks to which we are called. Students recognize that they have spiritual gifts and share them with others through their participation in Mass and prayer services, reflections in class, and through a variety of service opportunities. From Buck-­a-­Stuff donations to leading school families, organizing food and clothing drives for the poor, sending candy to the troops, or just being kind to their classmates, students strive to help others, to lift them up, to lead by example, and to put their faith into action. 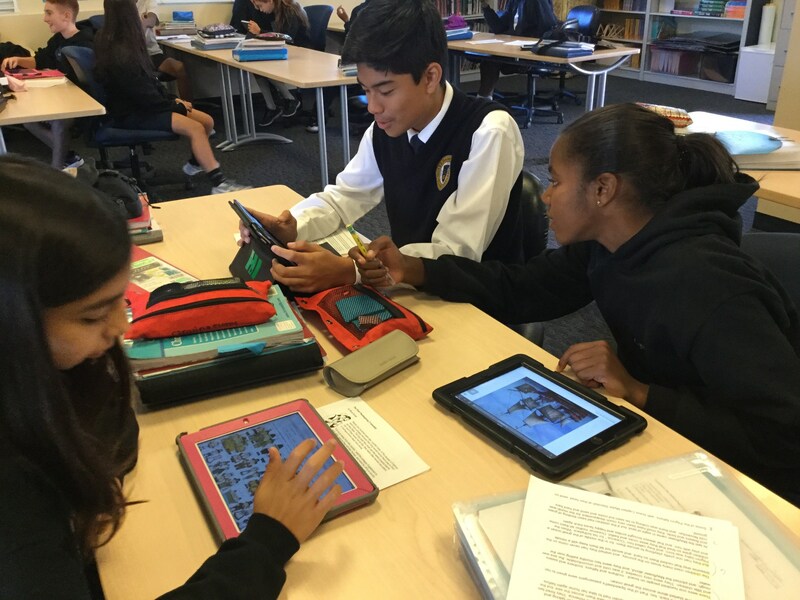 Students in the 8​th grade complete a social justice unit in which, through the reading of Fr. Greg Boyle’s T​attoos on the Heart a​nd a field trip to Homeboy Industries,​t​hey are asked to reflect on themes of forgiveness, grace, gratitude, friendship, and Catholic social teaching of the dignity of work, stewardship, the dignity of all people, care for God’s creation, and solidarity with others. The middle school SPARKE physical education program is a research­based standards­driven curriculum. The middle school SPARKE program builds on the foundation learned in the lower school with more advanced lessons that integrate health education, cardio workouts and skills­based activities to prepare students to stay fit and play organized sports in the middle school and high school years. PE teachers are trained yearly at the SPARKE institute in San Diego. Curriculum and all equipment needed to implement the SPARKE program is updated and purchased yearly to ensure a consistent implementation of the goals embedded in the program. Students work hard and play hard during PE. But most importantly, they know and understand the importance of a healthy lifestyles, sportsmanship, and reaching their goals as a result of this experience. Middle school students at NDAE follow a 1:1 iPad program where technology is integrated into each of their classes. Students now access textbooks digitally, allowing better portability of their texts. Our iPad program also allows students to demonstrate their mastery through creation of media pieces such as podcasts, Keynote presentations, and iMovie films. 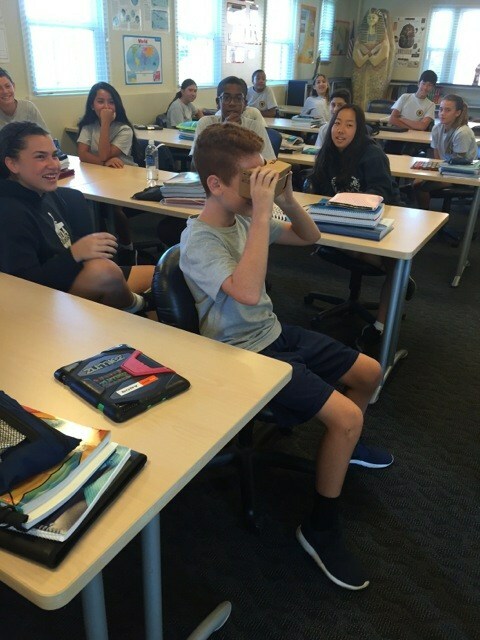 NDA promotes our students’ use of technology to make learning both fun and meaningful! Flex Period (Grades 6-8) Twice a week middle school students have a FLEX period class. Students have the opportunity to study, complete homework, and meet one­-on-­one with teachers. Students are supported in their study and organizational skills, building upon the skills learned in the 5th​GradeTransitional Middle School Program. Students create a SMART Action Plan with help from teachers to take responsibility for their success. Experiential Learning Students who practice what they're learning in a hands­-on environment can retain three and a half times as much information than just sitting in a desk and listening intently. 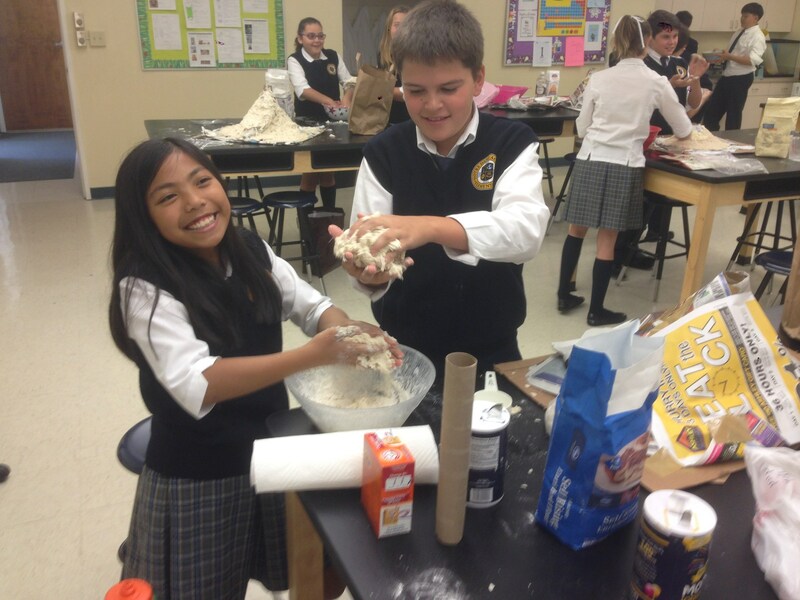 From calculating the speed and velocity of toy cars, to running an earthquake simulation with Jell­-o, to skinning a chicken wing to examine bones, muscles, and skin, students in Science are engaged in a variety of hands­-on activities designed to enhance learning. But hands­-on projects are not limited to Science. Students recreate Rome and run a Warlords of Japan simulation in Social Studies. 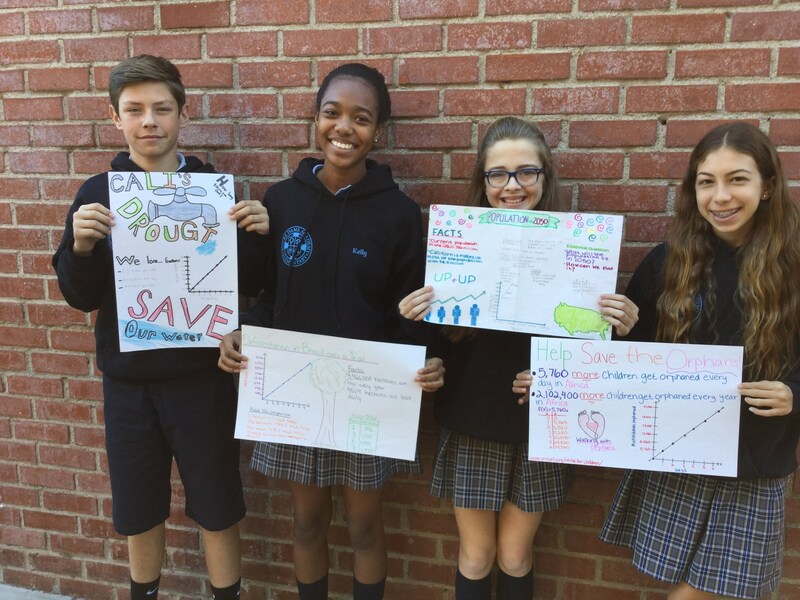 They put their math skills to use to calculate water consumption rates and solve other real­-world problems in Math and while working the Bake Sales and Snack Shop. They participate in service opportunities and plan religious services in religion, and run and lead the TK buddy program and School Families events to gain valuable leadership skills. Class curriculum is also enhanced by field trips designed to support instruction. 8​graders take field trips to the Museum of Tolerance when reading the D​iary of Anne Frank in Language Arts and Homeboy Industries following their reflection and analysis of T​attoos on the Heart​in in Religion. 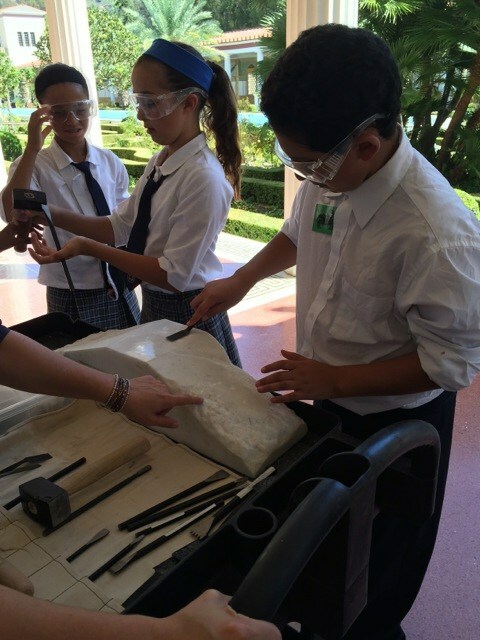 7​th Grade students travel to the LA Science Center to complement their science curriculum and 6​th graders venture to the Getty Villa to learn about Greek, Roman, and Etruscan life and artifacts supporting both Social Studies and Language Arts. In accordance with our mission, philosophy, and SLEs, we strive to nurture socially responsible citizens ­ persons of moral integrity who make a positive difference in today’s world. Church doctrine states that “(A) person is formed for b​eing­with​and for­others,​which is realized in love” (Educating Together in Catholic Schools). NDAE forms such persons by providing students with many opportunities to serve others. Making sandwiches for a local food pantry, collecting Halloween costumes for a women’s and children’s shelter or donating toiletry items for a homeless shelter, NDAE students and their families serve the local community. Additionally, each class sponsors a service organization. Throughout the year students learn about their class’s organization and raise money for their cause through Buck­a­Stuff donations. In addition to these outreach projects, there is a concerted effort to serve each other on campus, as each student, teacher, administrator, and parent strives to Lift Each Other Up through words and actions, SLE awards, character education, and anti­bullying campaigns. At NDAE we love, serve, and grow together as a family.